A new Avengers: Endgame synopsis calls on the services of Captain Marvel. Last week, Disney Australia's website revealed the first synopsis, which hinted at big consequences for the Avengers in going up against the Mad Titan for a second time and regrouping with the surviving allies to help reverse the Decimation. That first synopsis did not mention Carol Danvers, though we know that she will be included in the movie. Marvel Studios is trying to let out as little official information about the sequel as possible, and some fans have even accused the studio of digitally erasing characters from the two trailers that have been released. The latest trailer for Avengers: Endgame shows that the world is in a dark place after the Decimation. Thanos was able to complete his goal, but it cost him an awful lot in the process. With that being said, it's up to the surviving members of the team to come together along with some outside help. You can read the new Endgame synopsis below. "Following the devastating events caused by Thanos in Avengers: Infinity War... things on earth are looking dismal. After the power of the infinity stones decimated half of the population, Thanos (Josh Brolin) has taken up the mantle as ruler of the universe, leaving the Avengers in ruin. The demi-god will only expand upon his tyrannical rule - unless someone manages to stop him. So, with no time to mourn their losses, Black Widow (Scarlet Johansson), Thor (Chris Hemsworth), Captain America (Chris Evans), and Bruce Banner (Mark Ruffalo) must remain resilient and rally the remaining members of earth's mightiest heroes - and call on the services of Captain Marvel (Brie Larson). Together, they must figure out a way to bring back their vanquished allies and defeat the Mad Titan, or suffer a hopeless existence..."
It's not clear how Carol Danvers will come into contact with Earth's Mightiest Heroes in Avengers: Endgame, but Captain Marvel star Samuel L. Jackson did recently let it slip that Danvers has a lot of powers and that time traveling is one of them. Obviously, time travel and the Quantum Realm have been heavily rumored to play a major factor in the sequel, but we don't know for sure if the pager at the end of Infinity War calls on Carol Danvers through time. Scott Lang and Carol Danvers may be the ones that help to reverse the Decimation in Avengers: Endgame. Lang was shown in the first trailer for Endgame, leading many to speculate that he was able to get out of the Quantum Realm safely. The real question will have to do with how Carol Danvers is able to time travel and if she uses the Quantum Realm or not. It has been stated that the mysterious realm will play a large role in the future of the Marvel Cinematic Universe. Captain Marvel hits theaters on March 8th, which is just around the corner. 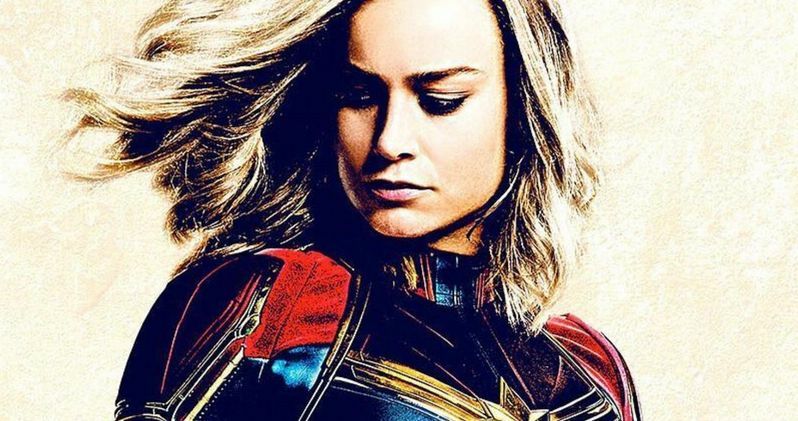 While the movie will focus on Brie Larson's Carol Danvers, there is a lot of hope that the movie will help set up her introduction in Avengers: Endgame. This will more than likely be done through a post-credit scene, to help tie everything together, which means that it will probably be very brief. Thankfully, Endgame opens in theaters less than two months afterwards. The latest Avengers: Endgame synopsis comes to us from VUE.